I recently decided to explore Fiverr as curiosity struck and a need for a few small design projects to be done came upon my plate. Fiverr is a global online marketplace offering tasks and services, beginning at a cost of $5 per job performed, from which it gets its name. The site is primarily used by freelancers who use Fiverr to offer a variety of different services to customers worldwide. I found people offering to create logos, develop cartoon avatar, record voice overs, develop video intros, write articles, and even have a puppet read a script for you. Yes, it’s pretty insane what is all offered. What will you buy for five dollars on Fiverr? It’s important to understand that not everything is just $5 on Fiverr, many of the services are basic and you must purchase extras to add on additional features, such as multiple formats, color, additional options, or longer scripts. 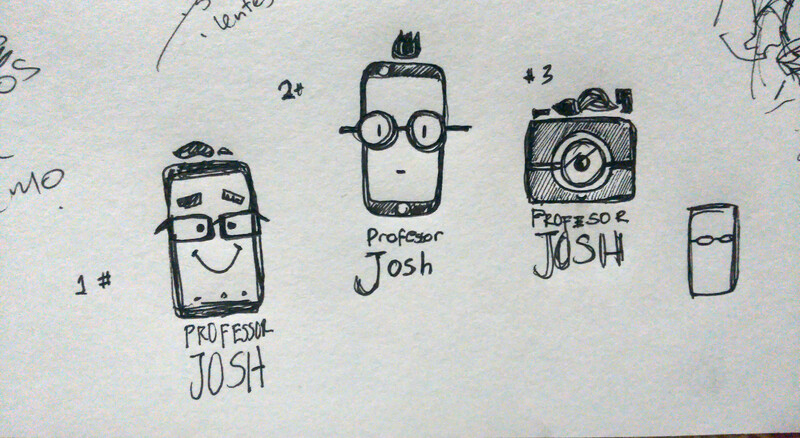 First was the retro logo development process for my brand Professor Josh. As seen below I had was given three version of a logo for $15. I did have the last graphic of the robot redone, since the original robot looks a little odd. Personally, I’m happiest with the first logo below. What are your thoughts? Next, I ordered for $5 an intro video that was made to look like it used a laser cut type feature to showcase your logo and website. It seems a little dark and hard to stand out. Might have been better to get a new logo before I decided to do this intro. Watch it below. I really needed an innovative and creative tee shirt design for the upcoming Startup Weekend Orlando – Valencia College Edition event I’m organizing. I decided to fork over the $10 and I was amazed at the product received. I would recommend the seller Astiramdani from Indonesia any day of the week. This is just an example of a few of thing ordered from this seller. I’m looking forward to ordering more. I love cartoons and always love becoming a cartoon, so I couldn’t resist Alifia work as an artist turning your photo into a real cartoon avatar. As you can tell, I have multiple things done by this artist and planning on sending a few more projects her way. Most were $5 each but a few of the cartoons had more people or full bodies, cost a little more. Exploring around Fiverr is sometimes daunting since there are so many choices of artist and designers. It’s important to look at the rating, see the examples, and see what you really get for $5 or more. I wasn’t always impressed with the outcome. Here is an example of mascot designed that wasn’t what I was expecting for $15 for three example. It was simply a few sketches on a napkin, which I could have asked my 7-year-old to accomplish. Sometimes you learn your lesson and more on to those that have better work and results. I did stumble upon another designed that is handy for those needing quick mock-ups of their website on multiple devices for presentation, websites, and more. I received 10 realistic photos with my website on each device’s screen. The devices varied from a MacBook, to iMac, to iPhone. I’m sure it’s simple to replace the screen on each of these stock photos but for $5 it worthsomeone’ss else time to quickly do this task for me. I’ll be conducting a boot camp at Orlando Tech Week on Wednesday, April 15th at 9:00 a.m. on Prototyping for Non-Designers and thought I need a logo for my sessions. Time to scout Fiverr and get another logo designed by another seller. This time they came out great and perfect for my upcoming presentation. As you can see, $5 can get you a variety of things and so much more to explore. Do your research, see example of past gigs, and have a little fun. Many times we can do these types of projects on our own but sometimes $5 is worth saving our own time for other projects or just getting a different creative view. Try this on fiverr: get over 700 stock photos and 100+ vector art all for only $5 !